All right, so we know you're probably still, 45 minutes after the Knicks' seizure-inducing 96-93 loss to the Boston Celtics to fall behind 2-0 in the Eastern Conference quarterfinals, sitting in the corner of your domicile, flicking the light on and off, muttering to yourself, boiling some some sort of cute animal on the stove. It is difficult to blame you. But if the Knicks were gonna go down ... heavens, what a way to go down. Legitimate question: Would any of those four men start for last year's Knicks? (You know, the one that won 29 games.) The Knicks' roster, with Amar'e Stoudemire and Chauncey Billups hurt, was so depleted that those four men were required to play the vital minutes in the most important Knicks game in 10 years, and that is entirely because of the trade for the fifth man on the floor. And you know what? Watching him, in a transcendent performance that will be remembered far longer than this loss will, you can't argue that it wasn't still worth it. 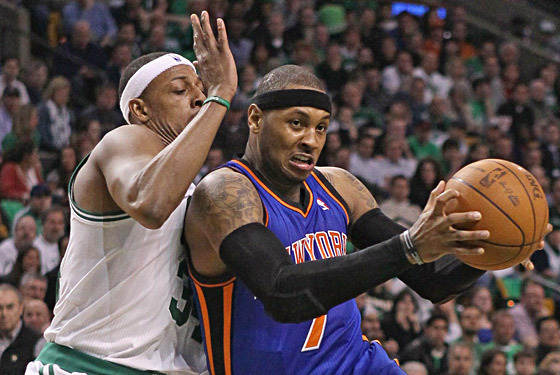 Carmelo scored 42 points and grabbed 17 (17!) rebounds -- he also led the team in assists with six -- but those stats don't even come close to capturing what Carmelo did tonight. The Knicks had zero business being close against the Celtics who, while having their weak bench and inside game exposed, didn't play all that horribly. Carmelo did what the Knicks were praying for when they traded for him, but somehow more: He was a one-man team when the Knicks needed a one-man team more than any playoff team should ever need a one-man team. Carmelo is not an inherently intense player; he is the anti-Garnett, smiling and loose even in the most pants-rippingly terrifying situations. But he had a look tonight. He had a look that the Knicks haven't been associated with since ... well, can you even put Patrick Ewing in that category? It was really something to see. History's gonna forget that Jared Jeffries -- Jared freaking Jeffries, that reclaimed remnant of the toxic Isiah era -- had just, 15 seconds earlier, pulled off the drive of his life to give the Knicks the lead. It's just going to remember that Jeffries -- who was wide open, let us not forget -- panicked, let Garnett come back on him and then turned the ball over. Our moment, the Knicks moment of eternity, was denied us. Anthony did not take the last shot. There was no last shot at all. The series was 2-0. Two crushing losses in a row, wins that were right there, begging to be taken ... scampering away. So there you sit, flicking that lamp on and off, on and off, on and off. Know that this is as bad as it will get, that this is the start of something, that Carmelo Anthony showed himself to be the sort of talent that is worth trading everything for. The type of talent that, when he's on the floor with Bill Walker and Roger Mason and Jared freaking Jeffries, makes you think you still have a chance. The Knicks lost tonight, and it hurt, and the Knicks are probably going to lose this series, and that will hurt even more. But with everything stripped away, all the cameras and the fawning profiles, and the reality television, all of it gone ... the Knicks had a player who could change everything, all by himself, and imprint a memory on your brain that will never go away. That matters. That counts.